Hybrids generated by crossing Kuril larch (Larix gmelinii var. 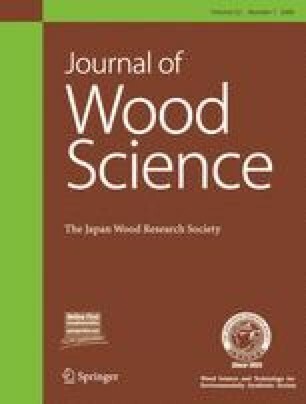 japonica) and Japanese larch (L. kaempferi) are expected to have high carbon accumulation ability because of fast growth and high wood density in Hokkaido, Japan. We estimated the amount of carbon accumulation of the hybrid larch in three progeny test plantations consisting of 21 full-sib families and compared the results to the carbon accumulation of open-pollinated progenies of Japanese larch plus-trees (improved Japanese larch). Gene-environment interactions were not observed for tree height and diameter at breast height but were seen for wood density (area-weighted density, AWD). The amount of carbon accumulated per unit area (Cstand) positively correlated with the stand volume. The AWD did not correlate with the Cstand; therefore, families with high wood density can be selected independent of the Cstand. The Cstand of the best full-sib family, female parent half-sib family, and male parent half-sib family at three sites were 106.1, 84.6, and 93.2 Cton·ha−1, respectively. All these values exceed the mean for the improved Japanese larch, which has a Cstand value of 82.5 Cton·ha−1.